Latvia’s elections: Can there be harmony without Harmony? 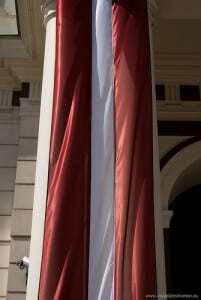 Latvia held parliamentary elections on 4 October. Licia Cianetti writes that while the elections saw Harmony – the centre-left party representing the country’s Russian-speaking minority – win the most seats, the results will most likely see the incumbent government led by the centre-right Unity party continue in power. The steady fall in turnout experienced in recent elections also suggests that despite backing the ruling parties, Latvian citizens are far from content with the status quo. The parliamentary elections that took place in Latvia on 4 October did not hold many surprises and are likely to return the incumbent governing coalition to power. The results, announced by the electoral commission soon after the closing of the polls, saw the Russophone-friendly, centre-left party Harmony once again in first place, with 23 per cent of the vote and 24 of the 100 seats in the Saeima (the Latvian parliament). This is a bitter first place, though, as the party lost 7 seats compared to the last elections in 2011. The governing, centre-right party Unity came a close second with a little less than 22 per cent of the vote and 23 seats. This is an increase from 20 seats in the last elections, but also shows that the merger with the disbanded Reform Party (which in 2011 got second place with 22 seats) did not bring significant electoral returns. The nationalist National Alliance (NA), also in the incumbent government, had their best result yet with almost 17 per cent of the vote and 17 seats, up from 14. The other governing party, the Union of Greens and Farmers (ZZS) also had a strong showing with 19.5 per cent of the vote and 21 MPs (up from 13 in the previous election). Alongside these four parties, which were all represented in the outgoing Saeima, two new parties entered parliament: No Sirds Latvijai (From the heart of Latvia, NSL) and Latvijas Reģionu Apvienība (Latvian Association of Regions, LRA). NSL gained just under 6.9 per cent of the vote and 7 parliamentary seats. LRA gained just under 6.7 per cent of the vote and 8 seats (the distribution of the votes by constituency accounts for the less-than-proportional seat distribution). The Table below shows the full results. Six out of the 13 parties that contested the elections, therefore, entered parliament. Of those that remained out of the Saeima, the ethnic party Latvia’s Russian Union (LRU, formerly For Human Rights in a United Latvia) was the most successful with a little less than 1.6 per cent, but still far from the 5 per cent threshold. Another notable ‘loser’ of these elections was the (in)famous oligarch Ainārs Šlesers’s new formation Vienoti Latvijai (United for Latvia), which lined up a list of former ministers and prime ministers but garnered less than 1.2 per cent of the vote. Neither party was present in the outgoing parliament and neither was expected to make it into the new Saeima, according to pre-electoral polls. The results of the European Parliament elections in May (when LRU unexpectedly retained its MEP), however, indicated that surprises could not be completely ruled out. All in all the new Saeima will have 41 new MPs, and 18 women (the full list of MPs can be found here). Voters made active use of the possibility to give positive (‘plus’) and negative (‘minus’) preferences to party candidates. In Latvia’s somewhat unusual electoral system, parties present a ranked list of candidates, but the final order (and therefore who gets into parliament) is decided by the number of ‘minuses’ and ‘pluses’ each candidate receives from the voters themselves. In virtue of this system, for instance, the famous Latvian actor Arturs Kaimiņš gained a seemingly unlikely seat by moving from the last to the first position in the LRA list. Harmony saw support for its leadership confirmed, as its parliamentary leader Jānis Urbanovičs was by far the most popular MP in the new Saeima with 36,598 ‘pluses’. However, the voters’ ‘minuses’ thwarted Harmony’s attempt at integrating some former members of the now disbanded Latvian centrist party Latvijas Pirmā partija/Latvijas Ceļš (Latvia’s First Party/Latvian Way, LPP/LC). This was an attempt by Harmony to consolidate its cooperation with former LPP/LC members, which is already in place in Riga’s local government. It was, however, Unity’s voters who sent the strongest warning signal to their party. Party leader and speaker in the outgoing Saeima, Solvita Āboltiņa, received such a high number of ‘minuses’ that she was moved from first to fourth place in her constituency list and left without a parliamentary seat. This might elicit changes at the helm of the party. In general, the high number of ‘minuses’ Unity’s candidates received from their own electorate (in absolute terms and compared to other parties) is a strong signal that the likely continuation of the current coalition as a result of the elections should not be taken as voters’ full approval for the government’s policies. It is highly likely that the current coalition of Unity, NA and ZZS will stay in power, possibly with the addition of LRA. The three partners in the outgoing coalition together hold a strong majority of 61 out of 100 seats. The internal balance of the coalition, however, will probably undergo some readjustment. With the collapse of the Reform party and the convergence of many of its members into Unity, the latter had been the most prominent member of the coalition. After the elections, ZZS and NA came out strengthened and will be able to negotiate the terms of their participation in a new governing coalition from a stronger position. This, according to some observers, might result in internal divisions and instability. The instability will likely be heightened by an internal scandal within Unity about alleged vote-buying by the head of the party’s parliamentary group, Dzintars Zaķis, which emerged just after the elections. Once again, the moderate Russian-speakers’ party Harmony has little chance of entering a governing coalition, despite its strength at the polls. In part because it is seen as the ‘party of the Russians’, Harmony has so far been kept out of government, although since 2011 it has been the biggest party in the Saeima. Without losing its Russophone support, Harmony has tried to rebrand itself as a European-style social-democratic party and Latvia’s only party on the left – to the extent that it ran in the 2014 elections under the name ‘Social Democratic Party Harmony’. This is no easy endeavour in a country that has been consistently governed by centre-right coalitions since its independence. Notwithstanding this, Harmony was hoping that the climate of dissatisfaction with unemployment, poverty and mass emigration would play in favour of its social-democratic message. Although a pre-election poll showed that a growing percentage of ethnic Latvian voters intended to cast their ballot for Harmony, the election results suggest that the party was unsuccessful in broadening its electorate. While Harmony retained its core voters, there was no social-democratic breakthrough. The promise of change offered by Harmony did not convince a majority of the electorate, which preferred continuity by voting back in the governing parties. Those who wanted to punish the incumbent government did so by loading Unity with ‘minuses’ or by voting for new parties. Former State Auditor Inguna Sudraba’s NSL, with its anti-corruption agenda, seemed particularly set to intercept those votes, including those of a portion of Russian-speakers. Internecine squabbles over a lack of transparency with regard to party funding, allegations that Sudraba had boarded a plane belonging to an FSB agent (a link to the allegedly incriminating video can be found here), and rumours about other potential connections to Putin’s circle possibly discouraged some of NSL’s potential voters. NSL entered parliament but did not repeat the exploits of Zatler’s Reform Party in 2011, which campaigned on a similar platform. Events in Ukraine also played against Harmony’s attempt at rebranding itself and attracting more ethnic Latvian voters. As the party was trying to refocus its message from predominantly ethnic issues to socio-economic ones, the Ukrainian crisis shifted the national debate from the economy to questions of international security and EU-Russia relations. Harmony’s long-standing cooperation agreement with United Russia, its position opposing EU sanctions against Russia (as detrimental for the economic interests of Latvia), and its inability to properly reassure the electorate that the party does not support Russia’s annexation of Crimea most likely thwarted the party’s aim of attracting a larger share of the ethnic Latvian electorate. The poor showing of the more Russian nationalist LRU, however, shows that events in Ukraine, and the focus on Russia and international security in the electoral debates, did not significantly radicalise the Russophone electorate. Ultimately, the Latvian elections delivered few surprises and are not likely to usher in a period of significant change in policy direction. However, no (or little) news is not necessarily good news. The strict ‘fiscal discipline’ and austerity policies that characterised the previous governments are likely to continue, and will do so in the background of declining voter turnout. In steep decline since 1993 (when almost 90 per cent of the electorate cast a ballot), in the last elections voter turnout reached an all-time low at 58.8 per cent. While this might be partially linked to Latvia’s mass outward migration, as suggested by President Bērziņš, it could also be a reflection of increasing popular dissatisfaction and disillusionment with the democratic process. Licia Cianetti is a PhD candidate at UCL-SSEES. Her primary research interests are in minorities, democratic representation and power. Her PhD examiness the political representation of Russian-speaking minorities in Latvia and Estonia and their access to the policy making.